On Tuesday, scientists released a study saying they had successfully used a new procedure, bionic reconstruction, to give three amputees new bionic arms. The three amputees are men from Austria who lost their arms in motor vehicle and rock climbing accidents. All three suffered from brachial plexus injuries, which damage the nerves that control movement and sensation from the shoulder to the hand. Dr. Oskar Aszmann, who directed the study at the Medical University of Vienna, told CBS News that existing surgical techniques for this kind of injury — before the innovation of bionic reconstruction — were "crude and ineffective." With their new bionic arms, complete with working hands, these three men will be able to perform basic tasks like throwing, writing, or holding objects. Aszmann said the success of this procedure represents the first time anyone has bionically reconstructed a hand. The men can control their new hands using only their thoughts. If I saw these kinds of patients five to seven years ago, I would have just shrugged my shoulders and said, "there's nothing I can do for you." Milorad Marinkovic, 30, lost his hand in a motorcycle accident over ten years ago and received one of the new bionic arms. Though there will always be limits to bionic limbs, Marinkovic has few complaints. His new hand allows him to finally play with his young children. "I can do almost everything with it," Marinkovic said. "I just don't have any feeling in it." Markus Kemeter, who received another of the bionic arms, said using his new limb is "quite easy" and he's had "no problems." So what's the innovation with these new bionic arms and hands? Haven't people been receiving workable prosthetics for years? Well, yes, but the difference is in the details. Until now, amputees with nerve damage were not able to use prosthetics they could control with only their thoughts. But with this new technology, there are more possibilities for amputees whose injuries caused nerve damage. Aidan Roche, who co-authored the study, said the new surgical technique "opens the door for treating other types of injuries." "Imagine an industrial worker who has put his hand into a machine and a conveyor belt ripped off the flesh and destroyed the bones," he commanded CBS News. 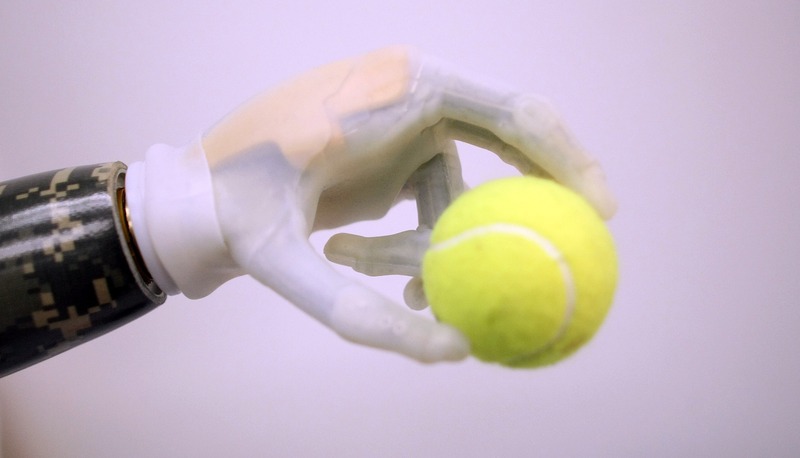 Even if you don't care to imagine that gruesome image, at least take heart — such a poor hypothetical worker might now be able to get his hand on (ha) a groovy new arm.